The World Series of Fighting makes its Kansas City debut on Friday night when they setup shop at the KC Municipal Auditorium in downtown KC. 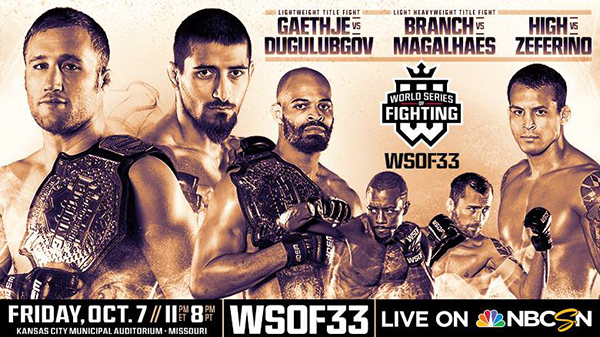 The card - which features WSOF lightweight champ Justin Gaethje in the main event - will be televised live on NBC Sports (DirecTV channel 220) starting at 10PM with the prelims to stream starting at 7PM on WSOF.com. Quite possibly one of the best lightweight on the planet, Gaethje continues his path of destruction looking for his 17th straight win. The undefeated fighter out of Grudge Training Center has only gone to the decision once in his last 12 fights. Gaethje was last in action in March with a dismantling of Brian Foster via leg kicks. Jackson-Wink's Ozzy Dugulubgov, a winner of three straight, will challenge for Gaethje's WSOF lightweight title. Jiu-jitsu superstar Vinny Magalhes will take on Renzo Gracie black belt David Branch for Branch's lightweight title. Branch is on an eight-fight winning streak and has looked unstoppable. Magalhes, a former Ultimate Fighter contestant, defeated Jake Heun in April to earn his title shot and has won four-straight since ending his second run with the UFC. The "Kansas City Bandit" Jason High will face Joao Zeferino. High, fighting out of his gym American Top Team HD with training partner LC Davis, has traded punches with some of the best including former UFC champ Rafeel Dos Anjos. High has instantly made an impact since joining WSOF last fall with a highlight real finish of Estevan Payan at WSOF 25, followed by a big win over Mike Ricci in June. A win over "The Brazilian Samurai" Zeferino could set up a future encounter with Gaethje. Zeferino is 20-8 and is coming off back to back losses to Jon Fitch and Brian Foster. Speaking of Foster, he will take on Blackzililan Luiz "Buscape" Firmino. Foster has had a long and storied career and has just about done it all in MMA, sharing the cage with household names like Jake Shields, Chris Lytle, and Matt Brown whom he submitted. Firmino is looking for his seventh straight win. With Firmino's ability to push the fight to a decision, and Foster's deep bag of tricks, this fight could easily steal the show on the main card. Former UFC heavyweight Shawn Jordan leads things off on the main card taking on Ashley Gooch. Gooch is riding an eight-fight win streak, all finishes, six of which were by TKO, but Jordan has shown he can take a punch. This fight could end quickly and violently. Locals of note on the preliminary card: "Super Duper" Bobby Cooper will take on Magomed Magomedkerimov. Cooper (12-7) out of Glory MMA and Fitness has had a roller coaster of a career competing on some of the top promotions in the country including Bellator, Titan FC, and RFA. He's coming off a loss to one of Bellator's top lightweights and border rival, David Rickels. Hard-hitting Brandon Phillips, out of Oklahoma, will face Bryce Mitchell to kick things off on the preliminary card. Phillips is coming off a win over Chuka Wills at Bellator 159 in Mulvane, KS.